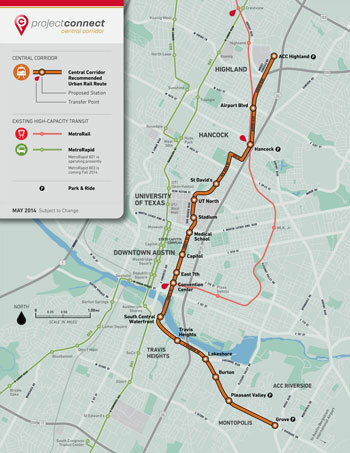 Although the entire Project Connect urban rail process has generally been a train wreck, one thing they’ve gotten right is not connecting to the airport. 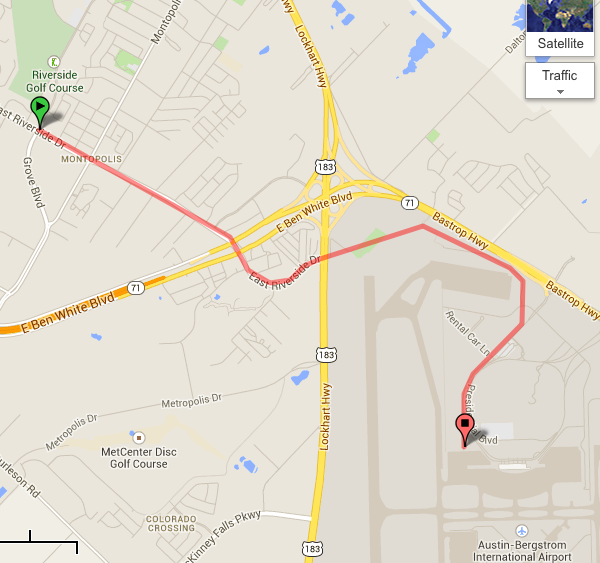 Airport rail connections are a bad investment generally, and would be a terrible use of funds here in Austin. Let me take a moment to explain. Four miles of additional rail at a projected cost of $145M per mile adds up to $580M. That’s 42% of the current projected cost for the entire system! And for that massive cost we’d get ONE additional station, the terminus at the airport. Given the land use of the surrounding area, there aren’t really any options for additional stations between Grove and the airport. It’s important to note that all these facilities connect to something larger than a single-line rail system. At the higher end they’re connecting to heavy rail systems that serve huge populations, and even then the rail ridership ceiling is still fairly low at 10-12% of the total airport passengers. What would the hypothetical look like for Austin? In 2013 Austin-Bergstrom International Airport was the 33rd busiest airport in the country serving 10,017,958 passengers. Let’s be extremely generous and take the 11.9% rail share the AirTrain JFK gets. That’d give just over 3,200 average daily riders. That’s basically the same as the Portland MAX connection, but almost certainly unrealistic since PDX serves almost 50% more passengers than ABIA and the MAX is a multi-line system with dozens of destinations. Still, even if we assume ridership of at least 3,200 daily, remember we’re talking about a capital cost of at least $400M. That’s a capital investment of $125,000 PER RIDER! And it doesn’t get any better when you considering the operating costs. While Project Connect hasn’t released any estimates for operations & maintenance yet, we can use the projections from the 2012 plan as a very rough estimation. That plan was for 4.6 miles of “urban rail” running from downtown to Mueller, and the O&M projection was $16M per year. That’s $3.5M/mi/yr. Again, let’s be generous and cut that in half. $1.75M per mile per year over a four mile connection is $7M/yr for AT MOST 1.1M annual riders. Again, these are VERY rough estimates, but I’d expect the required operating subsidy to come in near RedLine levels, and that’d mean cutting a LOT of essential bus service elsewhere in the city. Airport rail may sound like a flashy idea, but it’s rarely a good investment. And in Austin it would be a terrible initial investment in rail transit. Interesting. Reading your thoughts and Christof Spieler’s make me curious about this view now. Is there any consideration for the type of travelers flying into Austin? Would rail shares increase, and service be justified, if downtown / festivals / UT was the intended destination for most air passengers? In cities that produce a large share of tourism trips, and have concentrated downtowns, rail doesn’t make sense? Also, what would the acceptable rail share have to be for a project to be worthwhile? Those are all good questions. I’ll have to think on the details and dig up some data, but in general I think transit investments should serve the highest number of the people that pay for them. That’s especially true of ongoing operating subsidies. If you could make an airport connection pencil out by using aviation department funds for the capital investment and soaking tourists with a stiff airport surcharge, I could be convinced. I don’t think there’s much headroom for that surcharge though as you’d hit an equivalent taxi fare to downtown pretty quickly, especially if there’s more than one person to split the fare. – SFO, LGA, JFK are all major hubs. Those passenger counts are inflated due to passengers transferring to other flights. They are also much larger metropolitan areas that have visitors spreading out vs going to a downtown core (as the majority of convention, festival, etc visitors do here in Austin). – PDX has the cards stacked against itself, apparently. The Red Line takes nearly an hour to get from downtown to the airport. It’s a 25 minute drive. The point about hub traffic is a good one, and was raised on twitter as well. I can dig up the O&D data, and see what it looks like. While it’ll certainly raise the rail share at those facilities, I doubt it ends up changing the ceiling much for Austin. I consider the 11.9% share of the total JFK traffic to be generous for ABIA. If isolating to O&D traffic ups that to 20%, I wouldn’t find that a credible comparison for Austin even though ABIA traffic is almost exclusively O&D. It comes down to the utility of the connection. Newark connects you to the entire Northeast Corridor. One can even book multi-modal itineraries on the same ticket. The AirTrain JFK connects to the ENTIRE New York City Subway! Even the lowly (by comparison) BART system is an order of magnitude larger than the single line Project Connect is proposing. I doubt there are (m)any SFO passengers riding BART to/from Richmond, but the total transit shed is enormous. You also need to consider that Project Connect’s own maps projecting 2030 population and employment put most of the people and almost all of the jobs at the western edge of a 0.5 mile radius from the line. How many people want to walk 10 minutes in 100 degree heat while carrying their luggage? Most of the people using the airport in Austin are not visiting here, they are residents here who are leaving and coming back. SXSW is an outlier. Most days the majority of traffic to/from the airport is to peoples’ homes, which are spread all over the place, not to downtown. Your math on the capital investment is way off. Assuming your figures, $400M is spent on the investment–i.e., value over time. Let’s say we only got 20 years out of the rail before overhaul. At 3,200 riders (daily average), that’s 23M riders during the period. So, the investment is just over $17 per rider. The simple analysis I employ is a very common one for comparing projects. What you put in the denominator, whether it’s average daily riders, annual riders, at opening, after 10 years, or total riders over a given expected lifetime (as you suggest), doesn’t matter as long as you’re consistent. So if we compare to a hypothetical line at the average per mile cost Project Connect is proposing ($145M/mi), that same $400M would buy 2.75 miles of line somewhere else. That’s enough distance for any number of hypothetical projects. Lamar & Manchaca to Seaholm, 6th & Congress to St. Edwards, an eastern spur on 7th to Springdale, a western line on Lake Austin Boulevard. Take your pick or come up with your own. Then project the ridership on each one and determine what ridership you get for that same capital investment. Again, the ridership metric you use doesn’t matter as long as you use the same one for all the projects. Do that exercise and I expect you’ll find at least half a dozen better uses of that rail investment than a connection to the airport. The methodology is sound, generally. I agree that with any metric, consistent usage/application is key. Here, however, using a single day’s riders as the denominator doesn’t make a lot of sense–as if to say we would spend the whole investment on the first day’s riders. Your conclusion–that there are likely many easily found alternative routes that are smarter–is nonetheless evident/true. Thanks for sharing your view and analysis!